ArcGIS for Land Records delivers an array of powerful features, like parcel fabric, as part of the core software. Model workflows and templates enable GIS professionals to quickly provide tailored apps to end users. Jump start package accelerated the Douglas County GIS team’s progress, helping deliver quick results. Demand for the property maps maintained by local and regional governments is steadily growing. Their core function—showing where one property ends and another begins for tax levies—is now just one of multiple uses by government and others. One recent example was the aftermath of Hurricane Sandy, which struck the eastern United States in 2012 and caused an estimated $71 billion in damages. To assist in recovery efforts, adjusters from private insurance companies and the Federal Emergency Management Agency relied on local land records to assess and understand the damage. Yet, while demand for land records grows, funding for the agencies that create and manage them shrinks, forcing officials to seek efficiencies and reconsider traditional approaches. Hundreds of cities and counties have consolidated the many different functions that go into creating and maintaining land records by using the parcel fabric templates. The Douglas County, Nevada, GIS team uses the ArcGIS for Land Records solution and its parcel fabric to manage parcel maps for itself and other city and county governments it serves, including historic Carson City, Nevada. Consider Douglas County, Nevada. The county’s challenges have a common thread to local governments everywhere in that they revolve around land records management. In Minden, Nevada, the picturesque semirural community east of Lake Tahoe and the Sierra Nevada mountain range, Douglas County GIS supervisor Eric Schmidt’s four-person GIS team delivers services not only for the team’s employer Douglas County but also for neighboring Storey and Lyon Counties and historic Carson City, a tourist destination 14 miles to the north. Schmidt was experienced with Esri software before joining Douglas County and switched the department to the ArcGIS platform. Prior to Schmidt’s arrival, the county used ArcView, but mainly for collaboration with the local 911-CAD system. Douglas County is in the midst of advancing its GIS services using the ArcGIS for Land Records solution. Part of Schmidt’s vision was to expand the GIS team’s capabilities beyond producing printed maps for clients in departments throughout Douglas County and its neighbors. Because the GIS team was well established even before his arrival in 2010, it was kept busy filling requests for hard-copy maps. “That left precious little staff time for anything else,” Schmidt says. He and his staff were quickly able to take advantage of downloadable applications and workflow templates available for the land records solution. And even though their GIS department doesn’t have a developer on staff, they could build the kind of applications they needed. Since ArcGIS for Land Records is a commercial off-the-shelf (COTS) solution, it uses implementation patterns common in local government for land records. These include efficient data management, spatial analytical tools for value analysis, data access in the field, executive dashboards, and communicating information to the public. Unlike highly customized systems, COTS software is updated and supported. In 2012, Schmidt’s team was ready to start using the Esri parcel fabric—a dataset that is part of the Land Records solution—to help create and manage parcel maps. The parcel fabric enables users to stitch land parcels together like pieces of a quilt. That way, adjustments to one piece are automatically transferred to every other piece affected. Like the Land Records solution, parcel fabric is included as part of ArcGIS for Desktop Standard and ArcGIS for Desktop Advanced licenses. With the parcel fabric, users can take advantage of parcel polygons that are created from boundary lines and points with associated accurate legal information stored as attributes. This allows the user to have a seamless network of parcels with important legal dimensions. These points, lines, and polygons are easily updated using efficient editing tools designed specifically for maintaining land records. Users can also easily track the history of parcels and link to related record documents like deeds and surveys. Schmidt and his team worked with Esri Professional Services to help migrate parcel data into the parcel fabric in a process known as a jump start. Over a three-day period, Schmidt’s team and Esri migrated all the data for Carson City. 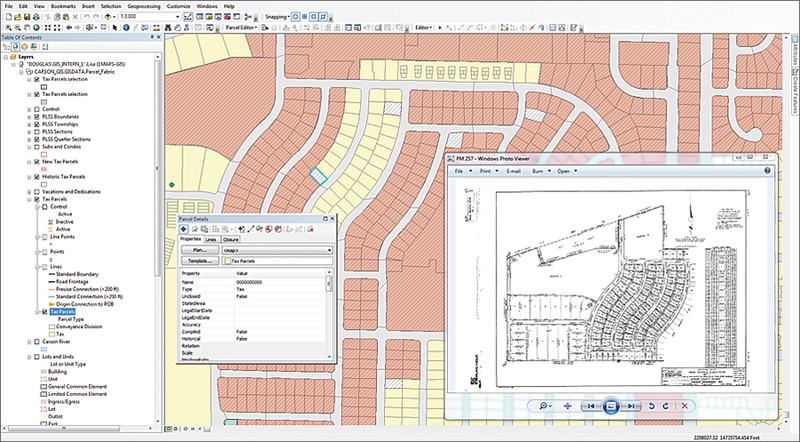 As part of the process, Esri consultants explained the structure of the parcel fabric, the parcel types defined in the Local Government Information Model, and parcel fabric editing. They also traveled with the team to Carson City to review assessor map books and the data structure. For more information, contact Eric Schmidt, GIS supervisor, Douglas County, Nevada, or Dan Stone, Esri.